This post is part of the annual “LAMB Devours the Oscars” blogathon at the Large Association of Movie Blogs. Scoot over to the main site for more in-depth coverage of this year’s Academy Award nominees. I’m thrilled to be covering the category of Best Achievement in Costume Design for the third consecutive year. As I tell Fletch every time I volunteer for this assignment, “It’s my favorite award!” For as long as I can remember, I’ve loved looking at fashion almost as much as I’ve loved watching movies. In this Oscar category, my two passions are happily merged. 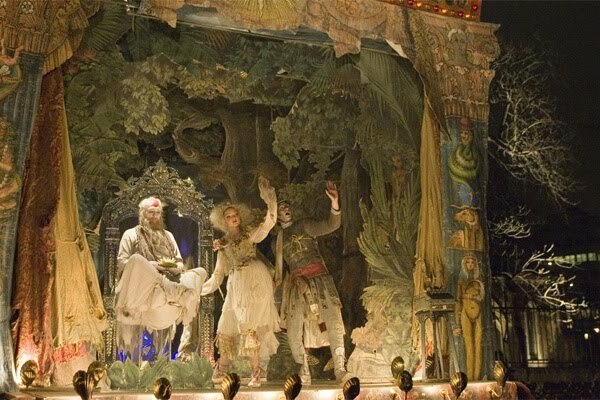 Of course, the true aim of the costume designer is not just to design beautiful clothing (although God knows the list of films honored in this category over the years have been loaded with gorgeous garb); it’s to create costumes that accurately reflect the times and lives of the characters who wear them. In a perfect world, the costumer manages both to dazzle us with his/her sartorial artistry and to give the film’s characters something to wear that tells us more about who they are than we’d glean from the plot and dialogue alone. Every year when I write this post, I’m always amazed at how brilliantly the nominees fulfill these objectives. 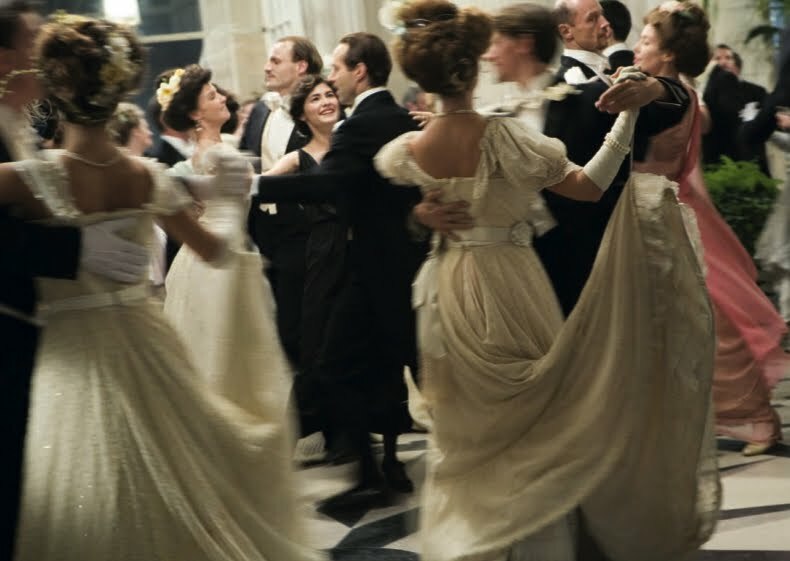 When you look closely at fine film costuming, you’ll always see the the ways in which the right dress, the right color or the most deceptively innocuous period detail can tell us volumes about the character who wears it. 2009 saw a wealth of fine film costuming efforts, and I was sad to see that two of the finest (“Julie and Julia” and “Cheri”) were overlooked entirely by the Academy. As for those that did score a nomination, well, let’s take a look…. But I’m less happy with Atwood’s other creation for Cruz. Below you see the late Anita Morris who originated the role of Carla in the 1983 stage production. She’s wearing a sublime, utterly iconic costume created by legendary theatrical costumer William Ivey Long (who won the Tony.) It’s witty, playful, scandalous (Morris was banned from performing “Phone Call from the Vatican” on the Tony telecast because of it) – and over the top. Few women would attempt to wear this in real life, but you know what Carla’s all about the minute you glimpse this get-up. This, by contrast, looks very much like something you could pick up in the lingerie section at Target. Where’s the wit? Atwood generally thinks outside the box, but her designs for “Nine” show little imagination or originality. No Oscar for her, methinks. Sandy Powell has a couple of Oscars to her credit as well, (“Shakespeare in Love” and “The Aviator”) and her work on “The Young Victoria” this year is the stuff of which Best Costume Design winners are frequently made. Those of who think of Queen Victoria as a lumpy old lady in widow’s weeds got a fetching eyeful of her youthful wardrobe (Powell had access to Victoria’s actual gowns as part of her research) and a heaping helping of the spectacular dresses and fancy frippery that Oscar voters salivate over each year. 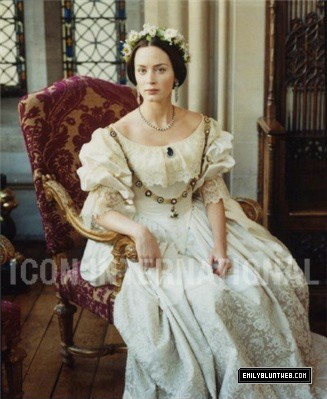 However the crowning costume achievement of “The Young Victoria” is this dress, the lavish ball gown which Victoria wears to the ball when she first goes public with her affections for Albert. It’s a gorgeous gold confection trimmed in roses, even if its impact is somewhat marred by the unfortunate special effect which has Blunt gliding into the ballroom as if on one of those people movers they have at the airport. Brava to Ms. Powell anyway. This film will be a strong contender for the award. Jane Campion’s “Bright Star” is about the doomed love between poet John Keats and Fanny Brawne, but it’s also about the patience and intense labor required to create truly beautiful things, whether they be poems or intricately constructed lace collars like the one on Abbie Cornish’s gown below. We actually see that collar being created in early scenes, and we get an accurate idea of just how much skill and talent it takes to design and construct it. 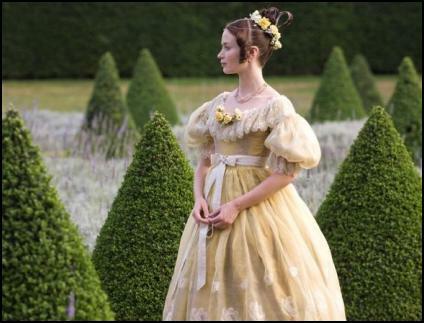 That alone makes “Bright Star” a deserving nominee, but Janet Patterson’s overall design work is award-worthy as well. The characters in this film are not rich – Keats, in fact, is downright penniless – but they are all creative and imaginative. And you can tell all of that from the way they’re dressed. Finally, there’s the “no brainer” nominee, “Coco Avant Chanel,” a biopic of the famed, innovative French designer’s early days. The film does its job, albeit in a workmanlike manner, of showing us how Chanel’s sense of style evolved and set her apart. Those who remember Audrey Tatou primarily as the darling gamine of “Amelie” may be surprised to see how raw-boned and plain she looks in her early scenes as the young Chanel, and I give the credit to costumer Catherine Leterrier. Moving among a sea of swans – ladies in tightly corseted gowns and huge, elaborate hats covered in feathers and lace- Chanel is a wide-eyed ugly duckling in mannish trousers, stiff shirtwaists and plain straw hats. It’s clear she doesn’t see herself that way, and she’s ahead of her time in rejecting the constricting corsets and ridiculous frippery in which the beautiful women around her drape themselves. You can see her striving for her own personal style, making bold statements with her clothing, but somehow falling short of chic. Then Chanel falls in love, and to go dancing with her lover, she has a low-cut black dress made to be worn sans corset. The appearance of that dress is the clear dividing point of the film, the moment at which Chanel’s personal style breaks through from stubbornly iconoclastic to elegant. And the film’s greatest weakness is that it never properly showcases the black dancing dress. See if you can even find Tatou in this shot below. In a whirling sea of white lace, that dress should have been given the opportunity to announce itself, but we’re barely given one good glimpse. For a film that’s all about fashion, this was a major gaffe. In the film’s later scenes, we begin to see the Chanel of legend, the modern woman with cropped hair and elegantly tailored suits such as this one. (And we learn the hidden bonus of this simpler way of dressing – as Chanel’s lover proclaims “You’re so easy to undress!”) The final scene is the showstopper: a seeming endlessly parade of models in Chanel designs descending a chrystalline spiral staircase as the designer herself looks on joylessly, sitting on the stair in her trademark collarless white suite, cigarette in hand. Those costumes are spectacular, but I doubt we can give Leterrier the credit for that. Those have got to be the real Chanel deal. In dramatic terms “Coco Avant Chanel” feels formulaic and predictable to me. In fashion terms, it doesn’t entirely succeed in showing us what made Coco Chanel an icon, and that’s largely because the film’s plodding screenplay and direction are all about making Chanel into a sad, lonely figure rather than glorying in what she created It’s not that the costumes are bad – they’re great – but director Anne Fontaine isn’t interested in showcasing them. “Coco Avant Chanel” should have been the shoo-in winner for this year’s Best Costume Design award, but I’m predicting that “The Young Victoria” will beat it handily.